This card cannot be Normal Summoned or Set. This card cannot be Special Summoned except by the effect of "Transcendent Wings". Tribute this face-up card on your side of the field to destroy all face-u..
During your Standby Phase, if this card is in Defense Position, put 1 counter on this card. Remove from play a number of card(s) in your Graveyard equal to the number of counters on this card to destr.. If this is the only card in your hand, you can Special Summon this card from your hand. 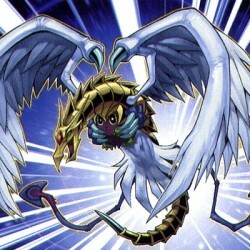 When this card is Normal Summoned, Flip Summoned or Special Summoned successfully, if there are no other cards o..
"Elemental Hero Avian" + "Elemental Hero Burstinatrix" This monster cannot be Special Summoned except by Fusion Summon. When this card destroys a monster and sends it to the Graveyard as a result of b..
"Elemental Hero Sparkman" + "Elemental Hero Clayman" This monster cannot be Special Summoned except by Fusion Summon. Discard 1 card from your hand to select and destroy 1 face-up monster on the field..
"Elemental Hero Clayman" + "Elemental Hero Burstinatrix" This monster cannot be Special Summoned except by Fusion Summon. While this card is in face-up Defense Position, this card can attack your oppo..
"Elemental Hero Burstinatrix" + "Elemental Hero Bubbleman" This monster cannot be Special Summoned except by Fusion Summon. When this card destroys a monster as a result of battle and sends it to the .. Send Fusion Material Monsters that are listed by a Fusion Monster Card fromur hand or your side of the field to the Graveyard, and Special Summon the Fusion Monster from your Fusion Deck. ..